The United Kingdom may have suffered the wettest winter since records began, but come hell or high water race fans will be ready for the tsunami that is the 2014 Cheltenham Festival. Free Racing Tips - Click Here - They will literally break your bookmaker's balls! It's time to bring it on! From Tuesday 11th - Friday 14th March the National Hunt calendar delivers four days of exceptional horse racing including: Champions Day, Ladies Day, St Patrick's Thursday & Cheltenham Gold Cup Day. The festival sees the best of British and Irish-trained horses competing for glory. Watched by millions worldwide, more than two-hundred thousand people attend this annual pilgrimage. Tuesday, March 11th, brings the first day of the Cheltenham Festival, held at Prestbury Park, Gloucestershire. A seven-race card kicks off proceedings. With an attendance of over fifty thousand people the atmosphere builds to a crescendo with the ''Cheltenham roar'' which refers to the enormous amount of noise generated by the crowd as the starter raises the tape for the first race of the festival (1:30 Cheltenham's Skybet Supreme Novices' Hurdle). Take a deep breath. Place your bets. Savour every moment of this racing spectacular - where equine stars are hailed. Listen to the sound of winning hooves, beating faster than your racing heart. Here is a selection of races featuring the favourites of this year's action and nostalgic glimpse of our greatest racing champions. The most important hurdle race of the season: The Champion Hurdle. This Grade 1 race, run over a distance of two and a half miles, has eight hurdles. It is open to horses aged four years and older. Notable triumphs include the inaugural winner Blaris (1927), Istabraq (2000) and last triple winner & legendary Dawn Run (1984). She was only the second mare to taste victory in this contest, going on to win the Cheltenham Gold Cup (1986). The only horse to ever complete this double. Last year's winner Hurricane Fly, trained by Willie Mullins, was the first horse in 38 years to reclaim the Champion Hurdle after denying old adversary Rock On Ruby, who heads for the Arkle Chase. This bay gelding, a son of Montjeu, is presently 3/1 joint favourite in ante post markets. 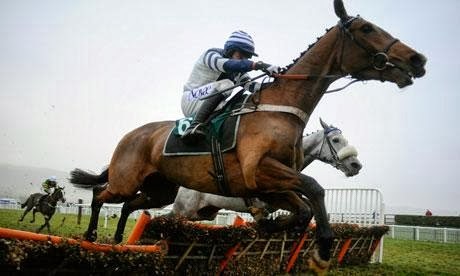 A true talent, this ten year old has won 21 of his 24 races over hurdles and achieved prize money of over £1.6 million. His main opposition include The New One, My Tent Or Yours & Our Conor, a five year old gelding, who was a facile winner of last year's JCB Triumph Hurdle. The second race of the opening day of the festival is the Arkle Challenge Trophy. This Grade 1 Nation Hunt Steeplechase is open to horses aged five years and older. Covering a distance of 2 miles, twelve fences are jumped on the Old Course. This race is for novice chasers and a test of both speed and jumping. Bright Penny prevailed in the first running of this race in 1946, ridden by Glen Kelly and trained by Bobby Norris. Historic winner Alverton (1978) went on to win the Cheltenham Gold Cup. Last year's race was won by the Nicky Henderson-trained Simonsig, who is out for the season, recuperating, after developing a splint on his near-fore. Willie Mullins trains the 7/2 ante post favourite, Champagne Fever, who won the Supreme Novices' Hurdle at Cheltenham. This grey gelding needs to come back from an odds-on defeat when only third at Leopardstown in December. The main contenders include Dodging Bullets (6/1) who is trained by Paul Nicholls, and bred by Frankie Dettori, Trifolium (6/1), Rock On Ruby (7/1) who won last year's Champion Hurdle for Harry Fry, while Alan King's Valdez (9/1) is another among a large field of entrants. The Cheltenham OLBG Mares Hurdle is a fascinating event. This Grade 2 National Hunt hurdle race is open to mares aged four years and older. Nine hurdles are jumped over two and half miles on this left-handed course. This race was established in 2008 and the winner's trophy for this event is named in the memory of David Nicholson (1939 - 2006), a talented jockey & trainer. Since the inaugural winner, Whiteoak, this race has been dominated by super mare Quevega. Ruby Walsh has ridden her to success. In fact, this daughter of Robin Des Champs has won the last five contests. The Willie Mullins-trained ten year old is unbeaten in her last eight starts and price 4/5f in ante post markets. Her trainer has a strong hand in this race with 9/2 second favourite Annie Power to test her mettle. This six year old is unbeaten in all of her ten starts, of which seven were over hurdles. The main opposition include: Cockney Sparrow (8/1), Sirene D'ainey (10/1) & Glen's Melody (14/1) from what could be a large field. In previous years this race has fielded up to 21 runners.